Longshore drift is the name given to the process by which beach material is transported along the coast by the action of waves. Waves rarely hit the beach at exactly right angles to the coast, and are far more likely to hit the beach at an angle. This is because in many areas the prevailing wind controls the direction of the waves and, obviously, very few long sections of coast are dead straight for miles and miles. As waves approach a beach the base of the wave hits the sea bed. This is what causes it to topple forward and to ‘break’ but it also allows the wave to pick up sediment. The size of the sediment particles moved by the wave is determined by what is available on the sea bed, and by the power of the wave. More powerful waves can move heavier sediment particles. If the wave was to hit the beach at exactly right angles to the line of the coast, the water would go straight up the beach (swash) and straight back down again (backwash). The only movement of the sediment would be up the beach with the swash, and back down the beach with the backwash. When waves break on to a beach at an angle, material is pushed up the beach at the same angle by the swash, but pulled back down the beach by the backwash at ninety degrees to the coast. The sediment is moved across the beach as well as up it. When the wave runs out of energy the water starts to flow back towards the sea. Gravity pulls it straight down the beach, so the returning water follows a different path to the one it followed on the way up it. Each wave can move the sediment a little further across the beach. 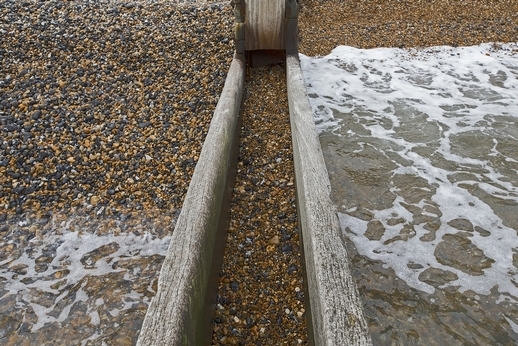 The photograph shows a series of wooden groynes stretching down a sand and shingle beach. You can see that this side of the nearest groyne, protected from the waves, has become an area of deposition where sediment is built up. On the other side of the groyne the beach level is lower because it is an erosional environment where sediment cannot settle. On many beaches you can find height differences of several meters on different sides of a groyne. Many a beach walker has had a nasty surprise when leaping over a low groyne and finding a drop the other side! 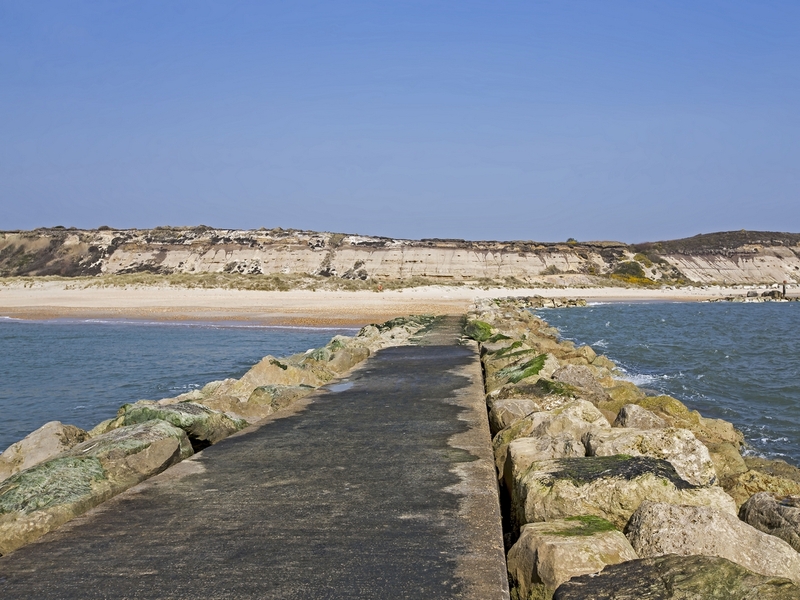 A riprap armoured groyne interferes with longshore drift at Hengistbury Head. Longshore drift comes from the right of the image, transporting beach sediment along the coast from right to left. You can see that on the right-hand side of the image the beach is quite narrow and the waves have enough energy to form white tops. This is an area being eroded by the longshore drift; more material is removed than is deposited. 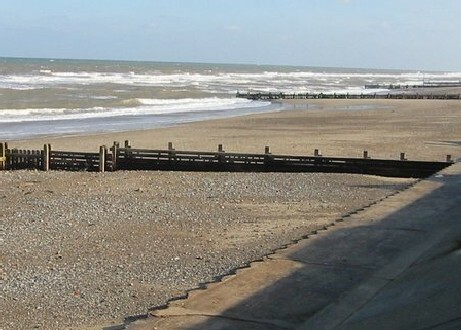 On the sheltered left-hand side of the photograph the waves have less energy (no breaking white waves) and the beach is much wider due to the groyne protecting the area and leading to increased deposition. Deposition always occurs on the side of a groyne protected from longshore drift, whilst erosion occurs on the side exposed to it. This photograph was taken when standing on a groyne and looking up the beach. A wave has just broken and you can see that the water has travelled considerably further up the beach on the right-hand side of the groyne compared to the left-hand side. This is because there is less sediment on the beach on the right-hand side than on the left. From this observation you can determine that erosion is strongest to the right of the groyne and deposition is predominant to the left of it. The conclusion is that longshore drift is operating from the right of the image, pushing sediment towards the left.